The primary charm of Walls is that it really is an “illegal alien lesbian musical,” a simple romantic musical comedy peppered with delightfully cute numbers. But the songs and storylines all address thoroughly depressing contemporary topics like deportation anxiety, terrorism, homophobia, and Trump-era racism. Still, Walls manages to maintain that Mickey Rooney-Judy Garland “Let’s put on a show!” enthusiasm, except in this case Judy Garland is a lesbian, African-American immigration agent, and Mickey Rooney is an undocumented Latina played by a not-yellowfaced, actual performer of color. If you’ve seen a San Francisco Mime Troupe performance before, Walls is entirely consistent with the same formula they’ve used in these shows for years. It’s a “socially conscious” play, with an old-school, party-line liberal political ethic and a Looney Tunes level of sophistication. Only four actors are employed, each playing two to three different roles, and their musical numbers are backed up by a three-piece Vaudeville band with a Casio keyboard. 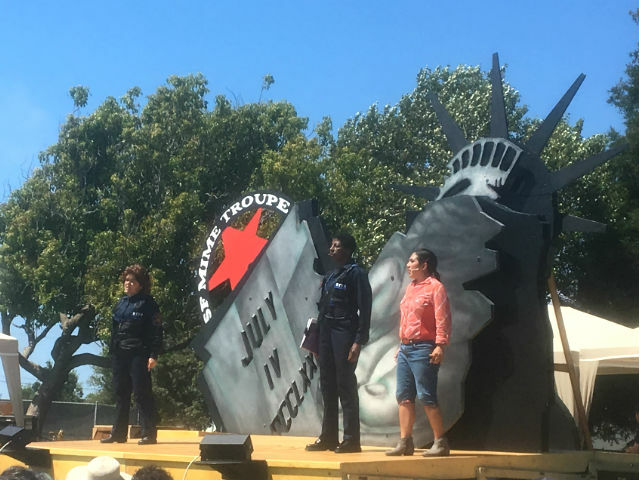 In other words, these free Mime Troupe shows are are notably scrappy and low-budget (though designer Carlos Aceves’ busted-up Statue of Liberty backdrop creates a striking, end of the original Planet of the Apes effect). Small amounts of wind will affect the microphones’ sound quality at these outdoor shows, and it may be the only play where the cast asks you for help tearing down the sets and loading them into a truck after the show is over. But it’s also one of the only plays where you can bring your dog with you, and you sure can’t beat the price of these free outdoor shows. Walls is essentially a classic ‘lovers being separated’ story, but told in a funhouse fashion with musical numbers and lots of satire. The conclusion uses a clever little Perry Mason plot twist that allows for a happy ending while the larger social issues continue to persist and get worse. And now that the Mime Troupe is doing shows in Donald Trump’s America, these social issues will indeed continue to persist and get worse. ‘Walls’ plays Tuesday, July 4 at 2 p.m. in Dolores Park. Additional shows are scheduled throughout the summer, all shows are free.